Yesterday I went to a function at friend’s house. She made dry fruits ladoo as a sweet treat for kids. She decorated it with sliver foil and kids loved it. I thought of making ladoo for my kids with different ingredients. I make sesame and jagery ladoo always but changed its recipe. 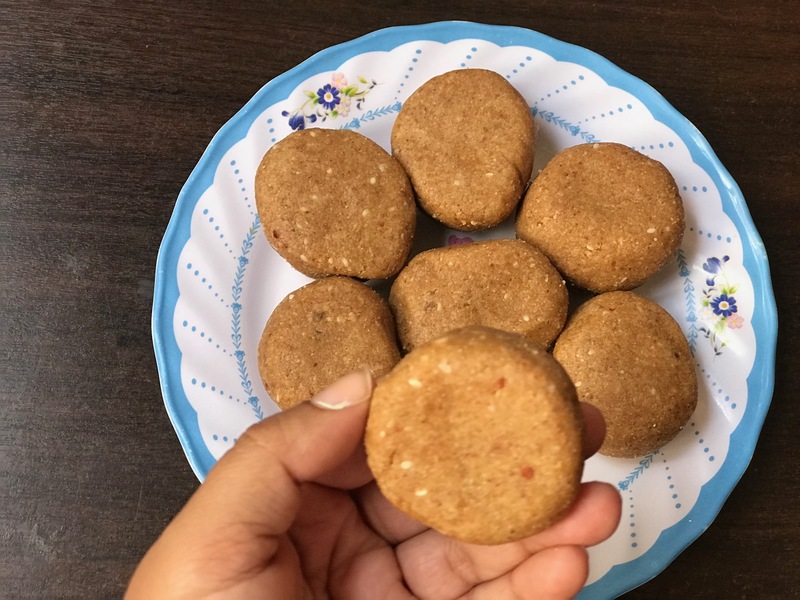 I have added walnuts in the sesame ladoo to make this nutrition packed snacks for kids. Walnuts are rich source of omega 3 fatty acids. Actually daily eating walnuts are good for health. Roast walnuts separately and grind with a sesame to make the mixture for ladoo.Try making sesame and walnut ladoo using following recipe and let us know the feedbacks in comments. Clean walnuts using dry cotton cloth. Roast sesame a pan on low flame for 15- 20 minutes or till nutty aroma comes from it. Roast walnuts on a low flame for 15 minutes separately in a pan. Grind walnuts and sesame seeds in a grinder to get coarse mixture. Break jaggery into pieces using mortar pastel. Grind jaggery in grinder to get fine jaggery powder. Mix sesame and walnut mixture with jaggery powder in a big bowl. Heat a pan and add ghee in it.Once ghee melts switch off the gas. Pour melted hot ghee in ladoo mixture and mix well . Sprinkle cardamom powder on a mixture. Form small circular shape ladoo of the mixture by pressing it with hands. Store the ladoo in airtight container.